The 10 Best Wine Bars in Delaware! With the craft brewing craze taking Delaware by storm, Delawareans may not realize just how many wine bars we have in our Diamond State. From honey mead wine to locally grown grapes, you can find many pairings to go along with your favorite meals. Here are our favorite wine bars in the state! The Liquid Alchemy Beverages company in Wilmington is owned and operated by a magical couple. Dr. Jeffrey Cheskin is a micro-biologist and his wife Terri Sorantino is an amazing cook. Together, they have created Liquid Alchemy, home to over a dozen award winning meads, and hard cider. Not sure what to try? Take a flight where you can sample several meads or ciders. The Grey Fox Grille & Public House is owned and operated by a local military family determined to create a relaxed, and festive environment. Taking inspiration from Delaware’s state animal, the Grey Fox, the restaurant serves to provide a social yet classy atmosphere filled with quality drinks and foods. They house local craft beers and wines at their bar and you can even rent out one of their rooms for up to 25 people to relax and unwind with. When locals think of Governor’s Café, they may not think of it as much than a kitschy, quality lunchtime favorite restaurant. But Governor’s Café in fact, has its very own wine bar with wines such as Cupcake Vineyards Moscato D’Asti, Trapiche Oak Cask Malbec, or try one of the more expensive selections such as Veuve Clicquot Brut (at $110.00). Whatever you decide on, you’ll be glad you stopped in for a sip. At the Rail Wine Bar & Grill is located inside the White Clay Creek Country Club in Newark. Pull up a stool at the bar and enjoy the quiet atmosphere. That is when the piano man isn’t playing. Never overcrowded, plenty of fine wines and excellent entrees, At the Rail Wine Bar & Grill will make you want to relax and stay a while after you’ve finished the back nine. Visitors say this is the exact kind of wine bar that Rehoboth Beach needed. Offering over 100 wines with the highest bottle being around $65, almost all of the wines are available by glass or tastings. The Vineyard Wine Bar & Bistro offers a delicious menu including items such as Korean barbecue flatbread and wild mushroom tarts. With a relaxing atmosphere in the shades of the wines themselves, The Vineyard Wine Bar & Bistro is a unique and delicious experience. The Eden offers an award-winning wine list and martini bar on Baltimore Avenue in Rehoboth Beach. With over a hundred choices for your palate, there are plenty of wines to enjoy. Not sure what to pair with shrimp Pad Thai or, pan seared day boat scallops, or crispy duck breast? Ask their staff who are more than qualified to help you choose the right wine or martini during your visit. Fondly named after Delaware’s state bird, the Blue Hen in Rehoboth has a select menu designed to pair well with their menu. Whether you enjoy red, white, or champagne, the Blue Hen has an amazing selection that you can preview on their website. The menu itself is as unique as the restaurant’s name. With meals such as Deer Creek Imperial Buck, Grey Barn Bluebird, 5 Spoke Tumbleweed (raw cow), and an extensive selection of seafood entrees, this restaurant is a rare treat for those who enjoy trying new and exciting flavors. With an award-winning wine list including over 450 wines with 40 of them available by the glass, Domaine Hudson is an upscale dining experience in the city of Wilmington. They have their own cellar with rare wines that are available for purchase from the public (as long as you get there before the next collector does). Featured on TheKnot.com, the premiere wedding website for vendors of weddings and wedding related activities, Domaine Hudson was voted best in the categories of wedding parties (such as engagement parties and dinners), luncheons, rehearsal dinners, bridal showers, and small receptions. While not being a wine bar specifically, Nantuckets in Fenwick Island has become a beach tradition for generations of tourists and locals alike for both great food, and great wines and both at an affordable cost. Enjoy raspberry, strawberry and blackberry covered crème brulee as you enjoy a glass of Moscato suggested by the friendly staff. Enjoy a bottle at a discounted price, and enjoy happy hour discounts as well. Pizza and wine make a perfect pair at Half Full in Lewes. 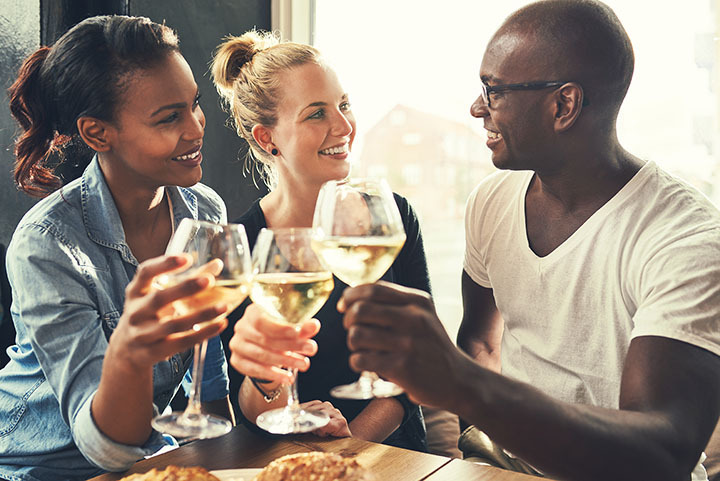 Located right on the picturesque, boutique-filled 2nd Street, Half Full has an authentic wine list carefully selected for their menu and customers, and an assortment of menu items that will pair perfectly with their choice wines. Enjoy prosciutto and pineapple pizza, soup, salad, or amazing desserts like the optimist bar (a pretzel shortbread crust), or a peanut butter krispie. Enjoy wines from all over the world, craft beers, or top shelf drinks mixed by their experienced mixologists.